Megalodon was quite simply the largest and most dangerous shark of all time, dwarfing all of its living relatives, including the great white and mako shark. It was a shark that attacked and fed on whales. Time: 16-1.6 million years ago. Size: 52 feet in length. Diet: Large fish, dolphins, whales and other large prey. Evidence: Fossils have been found inEurope, Africa, the Americas, southern Asia, Indonesia, Australia, New Caledonia and New Zealand. Fact: This giant had a mouth that could open to a width of nearly 10 feet. Some people think that Megalodon could still be alive today. We hope that they're wrong. Imagine staring out into the vastness of the open ocean from the comparative safety of a ship’s deck. All of a sudden you catch a glimpse of a 10 foot sabre shaped tail fin breaking through the surface of the sea. It soon dawns on you that a shark the length and bulk of a single decker bus is swimming towards you. It seems to be smirking with a mouth over 3 feet across. Working out how bad this situation is depends on what period of history you are in. If you’re in the present era then there’s very little to worry about. The only shark of that size alive today is the whale shark and although its maw is easily capacious enough for you to fit inside, the leviathan will never harm you, instead of fleeing, you can simply marvel at the creature’s grace and elegance. This gentle giant sustains its huge bulk by filtering tiny plank tonic organisms (mullet-sized fish are the largest food it will take) from sea water. Whale sharks do have teeth, several thousand of them arranged in about a dozen rows, but they’re tiny and fragile. However, imagine travelling back in time 4 million years to dive in the Pliocene seas. Its here that you come face to face with a shark that combines great size with almost insatiable flesh eating tendencies. Megalodon is as colossal as a whale shark, as ferocious as a great white and much more terrifying. Time: 4 million years ago. Location: Southern Peru, next to the cold oceanic currents flowing north from Antarctica. Shape of the continents: The shape and pattern of the continents are virtually indistinguishable from those of the modern world. South America is separated from North America by a thin channel of sea. North America and Asia are periodically joined by a land bridge across the Aleutian Islands. Much of the northern and southern polar regions are now obscured by thick ice, but not to the same extent as it is in the present era. 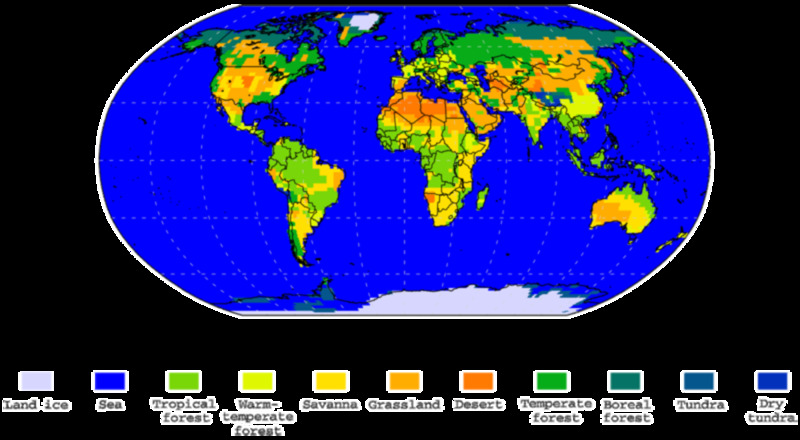 Climate and environment: The climate is cooling considerably and is much drier, the Earth is entering the early stages of an ice age. The North and South Poles are dominated by gigantic ice-caps that expand and contract. Mammals dominate both land and sea, living in every conceivable habitat, with some adapting to the colder weather either by evolving thick layers of blubber or by developing thick fur coats like the mammoths. The temperate and tropical forests have shrunk, replaced by grasslands that have become home to horses, cows and antelopes, which are in turn preyed upon by large cats and dogs. 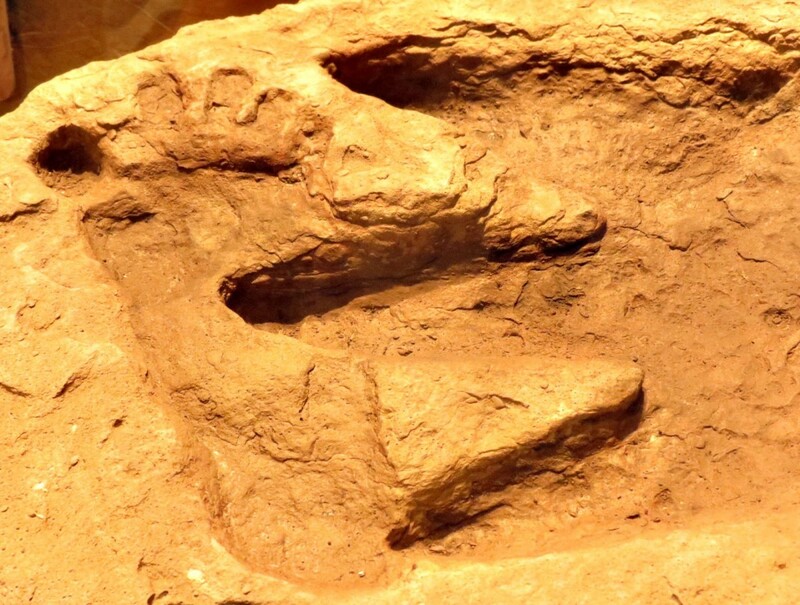 In East Africa the hominids have evolved bipedalism and are taking the first steps in a journey that will culminate in the development of human civilisation. 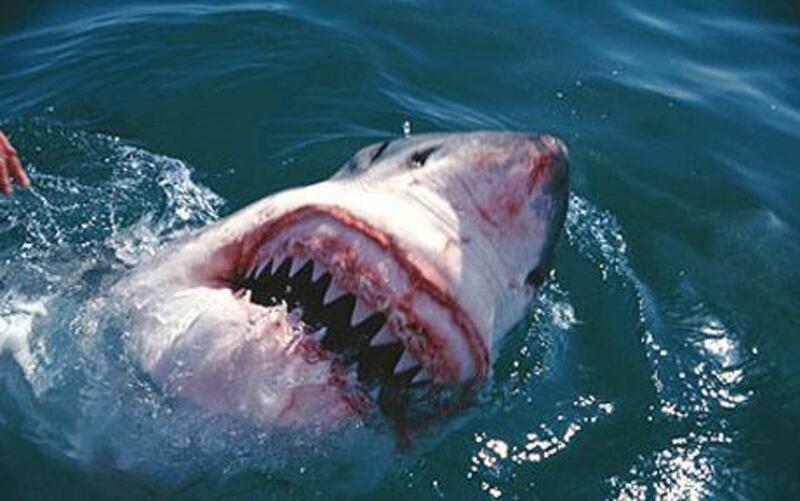 Hazards: In the oceans there's Megalodon, the largest shark that has ever lived and the top predator on Earth. Alongside it live modern looking great white sharks. 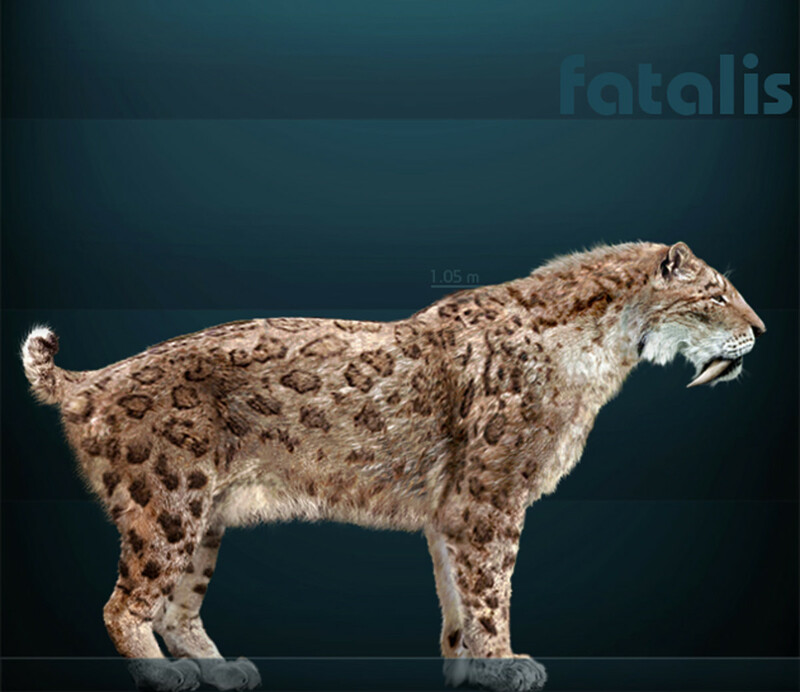 On land, there are large cats and dogs; there's also Thylacosmilus, a sabre-toothed marsupial from South America. A strange looking type of extinct whale that lived off the coast of Peru where it grubbed in the mud with its mouth, looking for food. Its most notable features were the male's tusks, one of which (always on the animal's right) could reach nearly 5 feet in length. Time: 5-3 million years ago. Size: 7 feet in length. Diet: Clams, worms and other mud dwelling animals. Fact: The males used their long tusks to joust with each other during the mating season. In the Pliocene era, one of the best places to go looking for megalodon is off the coast of southern Peru. The landscape doesn't look much different from how it will in the twenty first century, with an arid desert running right to the edge of the coast. But off shore the rich, fertile waters are teeming with marine life. The last thing you should do is try to meet an adult straight off. Its much better to familiarise yourself with some of the juveniles first. Being much smaller than the adults, they go for much smaller prey and so are found in totally separate habitats. 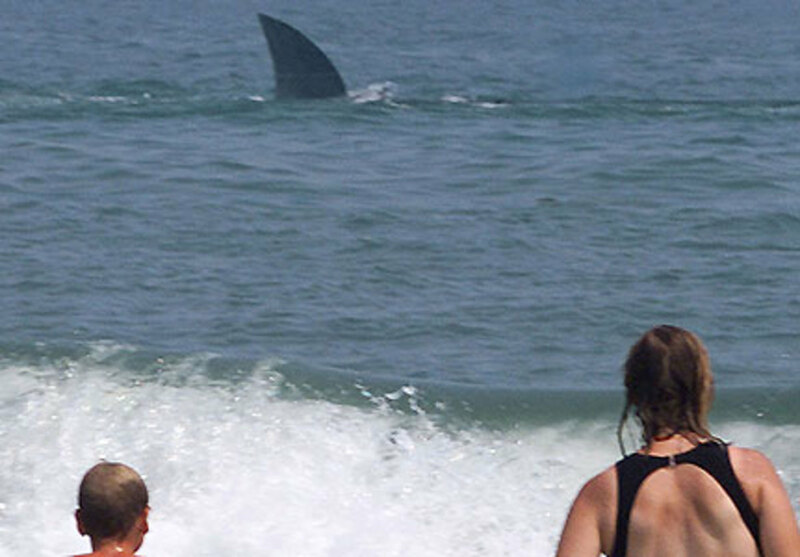 Juvenile megalodon generally stay close to the shore, often living near colonies of marine mammals, which serve as self service restaurants for flesh eating sharks of various species. The first step you need to take is deciding which prey to choose for your stake out. 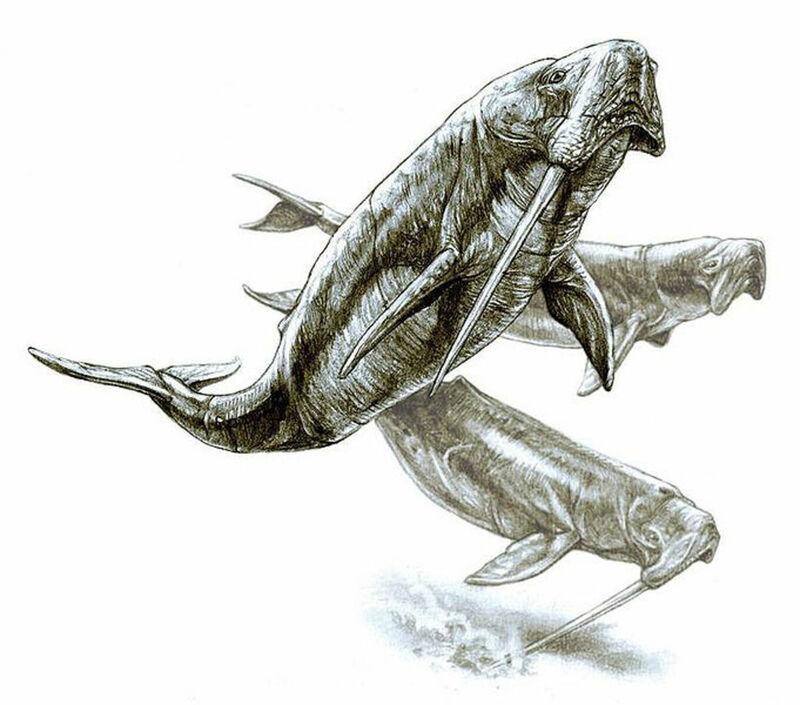 The shallow seas are teeming with seals that look similar to modern varieties, but there are also other, much weirder candidates paddling through the sea, thalassocnus, an aquatic sloth for one. Living on the shore, these creatures are caught between the desert and the deep blue sea. There’s precious little to eat on the land, so the sloth’s, which are about the size of brown bears, paddle out into the ocean to feed on sea grasses and seaweeds. Their strong back legs are adapted to kick powerfully when swimming and once they’re over the aquatic meadows they upend like a duck. Head down, they grab mouthfuls of vegetation, maintaining position by waggling their hairy tails. Sticking around the weeds in the shallows helps protect them from shark attack; megalodon are wary in less than 6 feet 6 inches of water and avoid the cloying feel of weed beds. A better choice of prey for a megalodon stake out might be the equally weird odobenocetops leptodon, whose name is a mixture of Greek and Latin meaning ’the whale which seems to walk on its teeth.’ It lives by snaffling up food from the bottom mud, so you need to dive to join it, seeking the security of a kelp forest on the seabed. Megalodon shouldn't attack you amongst the fronds and by remaining hidden you can avoid disturbing their potential prey. Although they’re related to modern monotonic whales such as the beluga and narwhal, odobenocetops looks like a cross between a walrus and a manatee. In size and shape they are reminiscent of manatees, some 6 feet 6 inches long. They have torpedo shaped bodies, V-shaped tails and paddle like forelimbs which they use to manoeuvre, by pivoting, sculling or paddling. They feed like walruses, using highly sensitive whiskers on their upper lip and cheeks to find and identify food in the seafloor sediment. Producing suction with their well developed cheeks, they hoover up crustaceans and mollusks. Whenever they are successful, you’ll see them puffing up mud and making slurping sounds. Another characteristic odobenocetops shares with walruses is a pair of tusks sweeping back from their rubbery lips. In this respect males are different from females. Females have two tusks of the same size, about 10 inches long. The male’s left tusk is a similar length, but the right one can reach an extraordinary 4 feet 6 inches and is presumably used in battles with other males during the breeding season. Many male odobenocetops have scars and wounds on their heads, even broken tusks, which tend to indicate that they fight amongst themselves. The patrolling predator keeps close to the kelp so that dappled light on its steel grey back helps it to disappear into the background of swaying fronds. Sooner or later an odobenocetops will surface to breathe and then the megalodon will strike from below, rushing upwards at speeds of more than 40 miles an hour. These attacks can be so cataclysmic that the sharks shoot into the air like rockets, sometimes with prey clamped between their teeth. Ambushing prey like this gives the shark a chance to deliver a devastating bite before backing off. It then waits until the prey is weakened from blood loss before following up with the coup de grace. Such behaviour minimises the risk of injury when fighting with large prey; the megalodon has delicate eyes and can’t afford to have them scratched by the tusk of a struggling odobenocetops. So after meeting a juvenile, its time to meet an adult, and the most reliable way to do that is to track their favourite prey. After spending their early years perfecting their ’maim first, kill later’ hunting strategy on seals, odobenocetops and porpoises, full grown megalodon graduate to become killers of whales out in the open ocean. So you are very unlikely to see an adult among these shallow kelp beds. Be careful not to look too much like a tasty odobenocetops going up for air, you climb straight up a large kelp plant, pulling yourself up arm over arm. Once safely back on board your boat, you can head out into deeper water where it gets really dangerous. 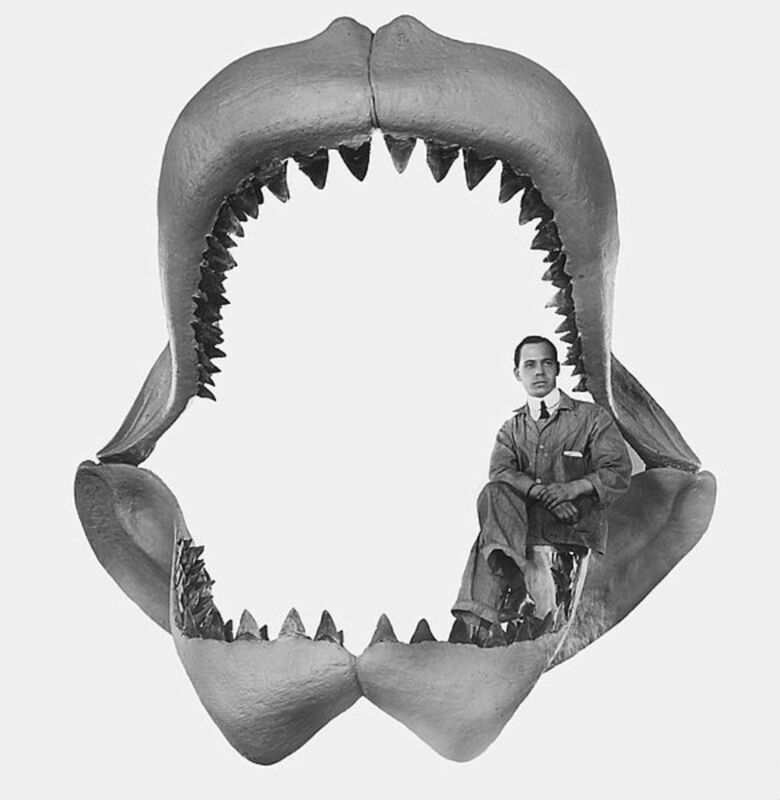 A website offering a wealth of information on megalodon, including why it became extinct. Originating near Antarctica, a cold, nutrient laden ocean current creeps along the seafloor until it collides with the edge of the South American continent. Off the Peruvian coast, it well upwards, bringing with it a bounty of marine life. The increase in nutrients allows floating microscopic plants to thrive; they are fed upon by tiny planktonic animals, the larvae of fish, crustaceans and jellyfish. These in turn provide a feast for larger larvae of fish, crustaceans and jellyfish. This planktonic soup is rich enough to sustain the massive bodies of baleen whales, and you soon come across a school of them. They feed by gulping in mouthfuls of water, which are then forced out through a series of plates growing down from each side of the upper jaw. Along these plates are bristles that act like sieves in which the planktonic flotsam is trapped. The whale uses its huge tongue to wipe the food from these fringes and then swallows it. These particular whales are a species that don’t exist in the twenty first century, but they’re similar to Bryde’s whale, a mid-sized species, growing up to 50 feet in length, with a dark grey upper body, lighter grey below. With any luck a megalodon will follow the whales, so from the boat you scan the ocean for any tell-tale sign. The chances of actually seeing a kill are slim, but a cloud of swirling gulls leads you to what is probably the aftermath of one. The corpse of a whale rocks gently in the swell, but the serenity of the motion belies the ferocity of the scene. The water is red with blood and there are gaping holes edged with tattered flesh in the whale’s throat. The screaming gulls wheel above, every so often diving down to pick gobbets of congealed blood or tidbits of meat. Every 30 seconds or so the whole corpse shivers as a shark takes a bite from it. You count at least a dozen triangular dorsal fins, some of which are huge and can only belong to adult megalodon. Some of the smaller ones may be great white sharks. Most of the feeding is going on beneath the surface, but suddenly a huge megalodon some 50 feet long uses a wave to surf up on to the body of the whale. The beast weighs over 30 tonnes and its sheer bulk means that for a moment the pontoon of meat is pushed under the waves completely. As the shark slides off it opens its jaws, to reveal a gape of over 6 feet, and, protruding from its gums are some 250 triangular teeth 6 inches in length. Their edges are serrated, as manufacturers of steaks will learn in a few million years time, serrated edges cut better and retain their sharpness longer than smooth ones. Closing its mouth, the shark shows the efficacy of its cutting blades, sawing off a chunk of flesh. Its idea of a bite sized morsel is almost 7 feet long and it swallows it whole, and in one go. At first it’s difficult to tell if the megalodon and other sharks are scavenging on a whale that has died of natural causes or whether one of them has hunted it down. The corpse’s flippers have hideous bite marks and as this is not a very succulent part of the whale, it’s likely the feeding sharks would leave it until last. The damage may have been inflicted when the whale was still alive, by a megalodon trying to cripple it. As if on cue to endorse this theory, a lunge from a shark pushes the whale’s back above the water to reveal that a large part of the tail is missing. So this whale was probably the victim of a megalodon, injured so badly by the initial strike that it could no longer swim to the surface to breathe. It would have died from a combination of blood loss, drowning and further attacks. This once mighty creature has been reduced to nothing more than a feeding station, thus an opportunity to come face to face with a 50 foot long shark has presented itself to you. So why did Megalodon, one of the most perfect killing machines ever to evolve become extinct? The answer may lie in its feeding habits. It has long been known that Megalodon preferred to feed on large marine mammals, especially whales, which are easy to ambush and cripple. With a weight of up to 48 tonnes to maintain, Megaldon would have needed to eat regularly and so it was fortunate that there were a great many whales available in the warm and temperate oceans where it liked to live. 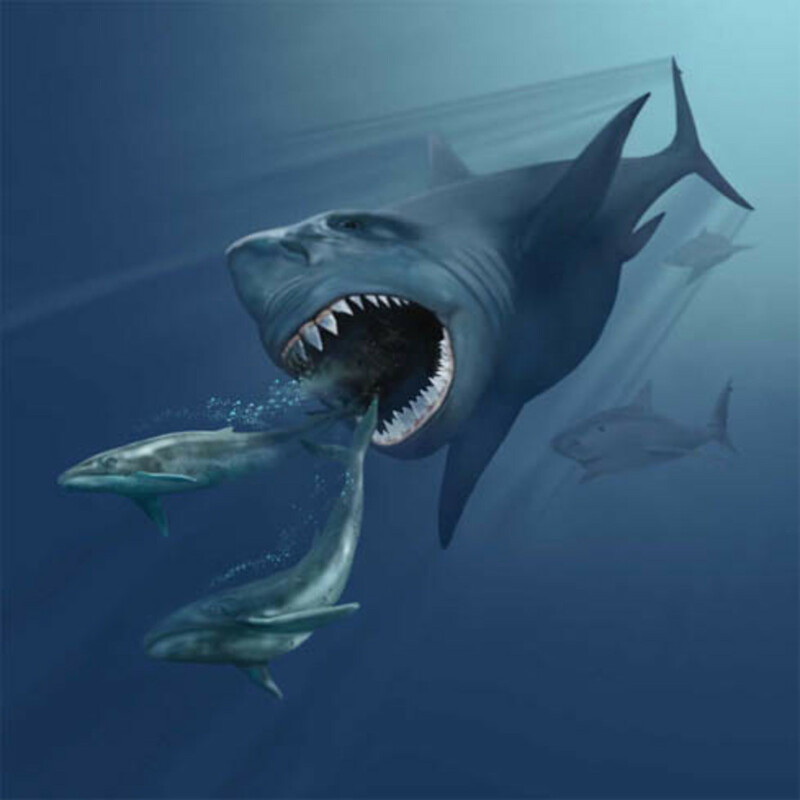 However, Megalodon lived during a time of great environmental change. For millions of years the southern Antarctic ice-cap had been growing in size, causing major changes in the world's oceans. Tentacles of icy-cold sea water were flowing north, chilling previously warm parts of the world and altering the flow of ocean currents everywhere. The disruption was immense and became more severe until, around 5 million years ago, the Earth began a long, slow climatic cooling that would eventually lead to the destructive ice-age cycles of the last 2 million years. The new areas of cold water at the poles proved to be an ideal breeding ground for many types of plankton, which in turn attracted vast numbers of fish. Around 5 million years ago the whales began to take advantage of this glut of food and migrated annually from the warmer seas to spend several months in the colder polar waters. To protect themselves from the cold, many species evolved thick layers of insulating blubber beneath their skin. The Megalodon shark, however, was not adapted to the cold and so could not migrate with its food source. It was stuck in the warmer tropical waters, but with all the whales gone, it became increasingly difficult for it to make a living from the sea. As the cold intensified, so Megalodon's numbers decreased until, around 1.6 million years ago, on the very eve of the ice age, it became extinct. Even though the sharks will probably be fully occupied gorging themselves on the whale for a while, in a feeding frenzy like this things can often get out of hand, so you need the protection of a shark cage tethered to the boat. The underwater view is awe inspiring. There are sharks everywhere. Some of their bellies are bloated from the sheer amount of meat they’ve consumed, others have their heads buried in a corpse like pigs at a trough. Just as you thought, there are eight great whites in the melee. The three megalodon in view are all sub-adults two or three times bigger than the juvenile you encountered in the kelp forest. The sub-adults are impressive enough, but where has that enormous adult seen riding a wave on to the whale’s back gotten too? When the other sharks scatter, you know it’s somewhere near. As you glance down between your feet the thick metal bars you are standing on suddenly look alarmingly flimsy. The megalodon is now below you. Its broad back has two dorsal fins, the larger a graceful triangular sail, the smaller one a diamond shape further back, in front of the tail. It has more of a snub nose than a great white, whose snout is so pointy that in Australia it’s nicknamed white pointer. Beneath the vast body you can see a pair of claspers trailing in the water behind, revealing that this individual is a male- claspers are sausage shaped tubes at the base of the tail used for implanting sperm inside the female during mating. The predator senses something above him. Curious, he does a wide loop, simultaneously rising up in the water column so that when he comes towards you, you are at eye level. He looks straight at you with the eyes of black satin; yours nearly pop out of your head. But they still take in every detail of the mega-carnivore heading your way. The shark isn’t just relying on his eyes; it’s using other sensory systems of extraordinary sensitivity to investigate the cage with its strange occupant. A shaft of sunlight dances over its head, illuminating what looks like a five o’clock shadow around its mouth and chin. This isn’t stubble however, the scattered black dots are the pores of what will come to be known as the ampullae of Lorezini, after the Italian anatomist who first describes them in 1878. These structures enable sharks to detect electrical fields in the water. The pores open out into jelly filled canals infiltrated by nerves. If there are any objects in the vicinity emanating electricity, impulses are fired to the brain. The megalodon will be sensing your beating heart and the impulses flashing through your muscles when you make any movement. If you move, as well as producing bodily electricity, you’ll also create water currents which sharks can detect as well. Now the megalodon is broadside on, you can see lines of large pores running along the middle of its immense flank and branching out into a tracery around its face called the lateral line system. Each organ on the lateral line contains a lump of jelly and if one of those bends because of perturbations in the water, a message is sent to the brain. It’s a bit like humans feeling the wind against their cheeks. The megalodon senses the water movement as you scull with your arms to maintain position in the cage. The monster slows but still keeps coming forward, now only an arm’s length away. Instinctively, you back off to the far side of the cage. The metal bars are producing a weak electric field and the megalodon is investigating this phenomenon. Without arms or tentacles, sharks that are curious about an object must use their mouths to check it out. This one opens its mouth wide; giving you the opportunity to look right down the throat of the biggest shark that’s ever lived. There’s a clunk as the cutting blades that are its teeth tell it that this isn’t an object that can be eaten; for a start, it tastes wrong, and there’s no blubber or soft tissue. The megalodon shakes its monstrous head and with one sweep of its mighty tail turns back towards the whale carcass. You, however, aren’t going anywhere, your limbs are numb with fear and it’s only the ragged sound of your own breathing that confirms that you are indeed still alive. After this experience, any time travelling diver would be shaken up. Before the encounter there were no guarantees that the metal bars would hold up to a megalodon; the strength needed for the cage could only be calculated from scaling up a great white shark and predicting its power if it grew to be 50 feet long. The cage did withstand the megalodon, however, and the creature that mouthed the bars, the sea monster whose throat you’ve looked into, didn’t spring from the imagination of a Hollywood film producer. This was the biggest flesh eating shark that’s ever lived. Megalodon-Prehistoric Jaws Of The Ancient Seas. Indeed, and I remember reading that even juvenile megaldon could reach the size of the largest great white ever caught within just two years! Scary or what!! I think if these monsters were alive in the oceans today I would never have taken up scuba diving. I know great whites and even bull sharks could kill me too, but somehow the size of this thing makes it all the more terrifying. Hi there, oh yes its definitely fake, its from a BBC documentary made about 10 years ago, its part of the 'Walking with Dinosaurs' series. Besides Megalodon's been extinct for nearly 2 million years. Thanks for dropping by. This was definitely an interesting hub to read, especially since I'm infatuated with marine biology at the moment. Terrific job! Except, I have a nagging feeling the video was fake. Am I right...? Hehehe! Its okay Sue, I know. Nigel Marven (the guy in the video) is quite eccentric, more of a Steve Irwin than a David Attenborough. Personally I prefer the latter. You know, of course, that I wasn't talking about you in my 1st paragraph at all (jeez, I hope you do). I was talking about the guy in the video. In my second one I was talking about you. Can I be one of your companions? This stuff fascinates me. Thank you Sustainable Sue, there's plenty of those kind of idiots around I assure you. But fortunately I'm not one of them. While I'm fascinated by monsters, I'd never try and get close to them, unless I was armed and had a few companions with me. OK, I'm going straight for the emotion. What kind of idiot would put himself so directly in harm's way as to stand on an outside platform, at sea level, unprotected, with a megalodon headed straight for bloody bait right in front of him? Of course he got knocked off . . . and of course, that would be the end of the video (disgruntlement). Great article, James. You have a way of giving readers the actual experience, rather than just pontificating about a thing. Thanks rf, oh yes I certainly do. Anything prehistoric whether it be a dinosaur or a Neanderthal, or a megalodon it fascinates me. Just wish there were more famous fossil sites near me. Thanks for popping by. Fascinating hub. The video was a trip! 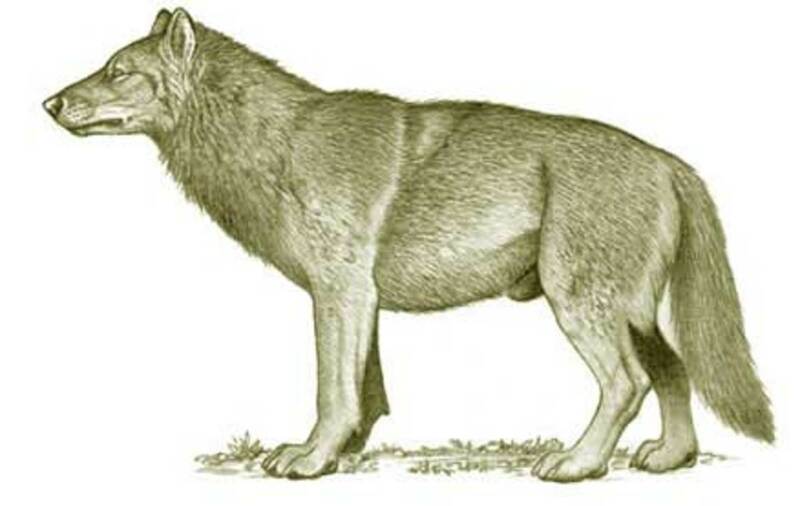 I've been interested in ancient animals since I was a kid (a long time ago). You obviously share a fascination with these amazing creatures. Thank you Michele, very glad to be of service. Appreciate you taking the time to drop by. This is a wonderful hub. You are teaching me a lot. I am interested in archeology. I appreciate this hub a lot. Thanks Pamela, I try and stay out of the water anyway, especially the open ocean. You never quite know what may be down there. Those sharks certainly look scary and I would certainly stay out of the water. This is a very interesting hub and I learned several new things. Voted up! Thank you JKenny I will give that a try and hope it works. Hi Sam, it seems to me that some of your hubs have become idle. The best thing to do is go back and edit them, maybe add more text, pictures and videos etc. Here's a few links that should hopefully help you out. Thank you Martin, glad you liked it. Thanks Dana, to be honest I'd never heard of an aquatic sloth, but trying to find out more about it was quite hard, strange really considering its such a strange creature. I also love the word 'flotsam' one of the chapters in Lord of the Rings is called 'Flotsam and Jetsam' and for some reason it popped into my head while I was writing. Thanks bdegiulio, you are very fortunate indeed, as I've never seen any shark teeth of any kind. Although I have seen real life sharks off the British coast. In the spring, we often get basking sharks filtering north to take advantage of the plankton that are particularly common at that time of year. Thanks Daven, and yes Texas is tropical, or at least sub-tropical anyway lol. Thanks sg, to be honest its something I would never do either, as I'm terrified of the open ocean. But still after watching a few documentaries you can't help but be fascinated by the creatures that live/lived in it. Thanks for stopping by. Texas! Isn't that sub-tropical? I think I'm safer here in the North Atlantic, the biggest sharks we get round here are basking sharks, and they're harmless filter feeders. I have a bit of a problem some of my articles are becoming unposted they are still published but thy are becoming unposted. What's wrong why is it doing that and what can I do about it. Thank you for sharing this fascinating reort. Totally cool! I love sharks. (and sloths too, just had to throw that in there). You do such a wonderful job bringing each "character" to life, taking the time to birng out the important details while adding descrition and telling a thrilling story. I was lost in the workd you created. This was like reading a novel that I couldn't put down. Great, great job. When we are in Florida we often go looking for megalodon teeth. Haven't found one yet but I've seen them in shops down there and they are very impressive. Voting up, sharing, etc..